Here's a nice hoodie by Ralph Lauren, in good condition. The hoodie has zip fastening, a drawstring hood, two pockets, & slightly elasticated ribbed hem & cuffs. All in all, a good looking hoodie. Pit to pit - 24” - Across the shoulder seams - 20”. 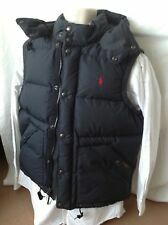 RALPH LAUREN POLO NAVY QUILTED JACKET - SIZE Large. Amazing item - lightweight jacket perfect for a spring or summer day. RRP is £200. Bought for myself but sadly a tad on the large size for me. This is a great item and a great chance for a bargain. Condition is used but still very good. Shoulder to Shoulder 44 cm - 17.3 in. - Sleeve Length From Shoulder 63 cm - 24.8 in. - Pit to Pit 51 cm - 20.1 in. - Sleeve Length From a Pit 53 cm - 20.9 in. 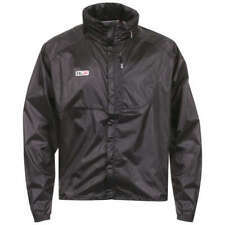 Can be worn as a Harrington or a more sporty type jacket has a hood that can be put away. Pit to pit is 52cm. Stunning vintage Ralph Lauren country denim jacket. Size is small, I measured around 21-22 inch pit to pit. One thing I will say about the jacket is the sleeves fall quite short, so please bear that in mind before bidding. I measured the pit to the end of the sleeve & it’s around 16.5inch. The jacket is vintage so has some slight signs of wear. The worst being some fading on the neck & some slight yellowing here too, I’ve taken photos of this so you can see for yourself, although it’s unnoticeable when worn. Also there’s a small pull or two on the back, also photographed. & a couple of very slight yellow patches on the back but they’re hardly noticeable at all, just mentioning for clarity. Polo Ralph Lauren Jacket. Ralph Lauren Logo on left chest side. Genuine s uper soft leather. Colour: Black. 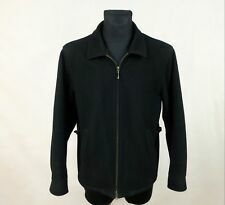 Ralph Lauren Polo Mens Lightweight Jacket Size Large. In excellent Condition apart from 2 very small holes. Hardly noticeable Dispatched with eBay delivery – Shutl 1 day. RALPH LAUREN Jacket SIZE XL Padded Puffa Khaki Size XL NEW!! Padded Puffa Khaki. RALPH LAUREN. £120 paid! Grab a bargain. Ralph Lauren Polo Orange Jacket Size XL. UK 12 14. Condition is Used. Dispatched with Royal Mail 2nd Class. Just having a good clear out. All items are of great condition- I change my wardrobe regularly. All items are UK size 10-14. Combined p&P can be arranged. Polo Ralph Lauren. CHEST/ARMPIT TO ARMPIT 57 cm or 22 in. LENGTH OF THE BACK 79 cm or 31 in. OUT SLEEVE FROM ARM 81 cm or 32 in. Blue Embroidered Windbreaker Jacket. RALPH LAUREN. Complete with two pockets. 75% Cotton, 25% Nylon. Machine Washable. See All Ralph Lauren Here. Condition : Very good, minor wear. See All Coats and Jackets Here. Upper part of the jacket = Quilted/Lower part of jacket = Cotton /Inside of jacket = Brushed fleece. Made in USA. There is a small mark to the outer left (as worn) of the collar and fraying to both cuff ends. Freshly laundered and ready for its new owner. C - SHOULDER - distance between shoulder seams straight across at the back: 21.5in (54.5cm). See All Ralph Lauren Here. Pit to pit: 27". Condition : Very good, just a couple of little marks on the upper right on the front of the jacket. Length: 26.5". The length of upperwear is from the nape of the neck to the bottom of the hem. See All Ralph Lauren Here. Length: 27”. Pit to pit: 29". COLOUR: Stonewash Blue. There are 5cm holes to both cuffs and a 2cm hole to the front fastening. The bottom of the back neck label is missing. This is based on the actual parcel weight that we have calculated and will be shown at the point of ordering. It would benefit from a clean to freshen it up and straighten it out. This is reflected in the price. Shoulder to cuff - 24. Shoulder to shoulder - 23. (Made from - 100% Polyester; Body lining: 100% Cotton. Size - Large. b) Length -64 cm | 25 in. Total length: 78 cm or 30 3/4”. Chest pit to pit: 56 cm or 22”. Sleeve length from shoulder: 65 cm or 25 1/2”. Shoulders: 48 cm or 18 3/4”. Material: 100% cotton. Sleeve length from neck: -. 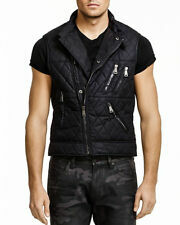 We are here to provide you top quality Designer clothing at competitive prices. BROWN LEATHER PATCH TO THE CHEST WITH LOGO. SIZE LARGE. LARGE BUTTON POCKETS TO THE FRONT. ZIP FASTENING WITH LEATHER ZIPPER. Back - 27" / 69 cm. pit to pit - 27" / 69 cm. shoulders - 22" / 56 cm. sleeve length (from shoulder to cuff) - 25" / 64 cm. sleeve length (from pit to cuff) - 20" / 51 cm. Don't miss out! Made from a cotton shell, it features a real shearling collar with detachable throat latch. Dual entry front pockets aswell as cool hidden zipper pockets in the side seams. Chest pocket with ring pull zipper. Down jacket by Ralph Lauren. Never worn. Size medium. Winner will not be disappointed. Total length - 68cm. Width from the armpit to the armpit. DOWN THE BACK, BOTTOM OF COLLAR TO HEM 25". SHOULDER TO END CUFF 25". SHOULDER TO SHOULDER 20". Really trendy and cool Bomber Jacket. With embroidered detailing, it features two pocket styling and a zip fly. Machine washable. 100% Cotton. This is inspired by the classic US military M65 parka jacket. Very good condition. Had little wear. Size: UK 44R - equals XL - EU 54. Shell: 80% Wool, 20% Nylon. Filling:100% Polyester. Lining:100% Polyester. Chest app. 26“, sleeve length from shoulder app. 25 3/4", center back length app. 35", across shoulders: 20 1/2". Length down the back of the jacket, not including the collar: 26.5". Black colour. Great condition!